The first surprise in Edel's book is that the title comes from Coleridge, not Shakespeare. The quotation is from his notebook, "stuff of sleep and dreams, with Reason at the wheel." This introductory quote summarizes the thrust of Edel's "experiments in literary psychology" as he calls his biographical/psychological approach to literary analysis. By investigating the products that artists form from their "sleep and dream" raw material, Edel uses his own rational understanding to steer his way to illuminations of the unconscious motives and tendencies of the artists. 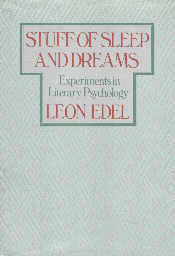 He has gathered in this book a series of articles and lectures pertinent to this one topic, "literary psychology." He spreads T. S. Eliot "like a patient etherized on a table" for exploratory surgery of his inner "wasteland." Tolstoy, he joins on the battlefield with Pierre, lying on their backs staring up at the infinite expanse of the sky - a poignant caesura in the midst of a brutal battle. James Joyce, he gives us a view of the wrap around dreams that resulted in his wrap around novel, "Finnegan's Wake." He takes from Joyce the inspiration for his chapter titled, "The Portrait of the Artist as an Old Man," in which he deals with three late bloomers of the literary world. Edel is at his best when he creates his triptych of the James family - Henry, William, and Alice. In each of the three children we see reflections of the unconscious drives of the elder Henry. The novelist part of the old man appears in full bloom in Henry, the mystic and psychologist in William, and the reclusive diarist in Alice. The novelist on the east side of the Atlantic Ocean, the psychologist on the west side, and the diarist shuttling back and forth. Ayn Rand said about her choice of names to replace her Russian Alice Rosenbaum that authors usually keep the same initials when creating a character from a real life person. Using Edel's principles of "literary psychology" one would conclude that Ayn Rand was the first character created by Alice Rosenbaum, who created in Ayn Rand's life script as gripping a plot as in any of her novels. At all levels the artist is creating and re-creating with the stuff of sleep and dreams, and most often the only Reason at the wheel" comes later in the person of the literary psychologist.